Click for the full size cover. It’s a familiar tale. Elite soldier returns home from the war, only to turn vigilante after his family are brutally taken from him by organised crime. This is no thinly-veiled Punisher knock-off though. What Mandroid is, is John Wagner at his bleak best, telling a depressingly inevitable story of one man’s slow destruction. Sergeant Nate Slaughterhouse’s nightmare begins when he’s blown to pieces in service of the Space Corps. Instead of letting him die, Kitty, his wife and fellow soldier, allows him to be rebuilt as part of the Mandroid programme, a cadre of near-indestructible cyborg super-soldiers. 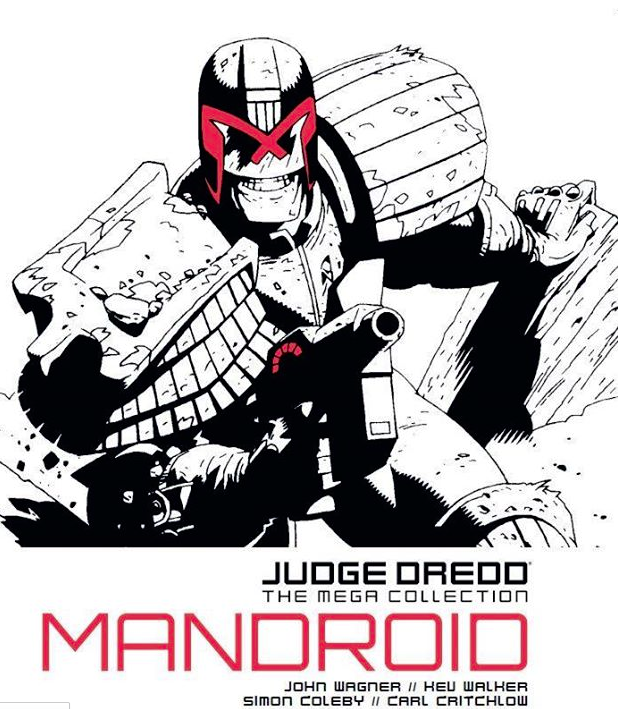 As hard as he is, Mega City One is harder and when the pair take their son back home to live as civilians, it all turns to ash pretty quickly, leaving Nate a tortured individual who clearly feels nothing as he snuffs out the lives of any perp unfortunate to bump into him. Slaughterhouse is as much Frankenstein’s Monster as he is Frank Castle. A giant, lumbering parody of a man, full of self-loathing for the creature he has become. It’s beautifully written, but almost painful to read at times. The tragedy continues in the second story in this volume, Mandroid: Instrument Of War, where a limbless Nate escapes custody (he’s that hard) to be rebuilt and manipulated into attacking the Judges themselves. In a truly horrible touch, Kitty makes a pivotal reappearance, but Wagner isn’t out to give anyone a happy ending here. It’s dark, it’s nasty and it’s a perfect illustration of just how unforgiving Mega City One has become under Wagner’s long watch. Sure, there’s villains a-plenty in these stories, but when it comes down to it, it’s the city itself that’s the real villain. It’s a hellhole beyond imagining and it says a lot that even a cyborg übermensch like Nate Slaughterhouse can’t handle it. Wagner’s on top form here, but he’s helped massively by the stunning art of Kev Walker, who’s stylised heavy blacks and contrast work echoes Mike Mignola, but is doing it’s own thing too. A perfect choice for a story like this, Walker excels at bringing the down and dirty world of the Big Meg to grim life as much as he suits the kinetic action scenes that Wagner peppers his script with. Mandroid is bleak, even upsetting at times, but it’s also brilliant and sees John Wagner at the very top of his game. There’s no higher praise than that.